Kochi: The public transport system collapsed in many parts of central Kerala with the Southern Railways and Kochi Metro on Thursday suspending their operations due to floods. Rise in flood waters in Periyar river due to continuous rains and opening of all shutters of all major dams including Mullaperiyar, Cheruthoni, part of Idukki reservoir, and Idamalayar, have severely affected the daily lives of people in areas downstream. The Kochi Metro Rail Limited (KMRL) also suspended its operations on Thursday morning after its yard in Muttom near Aluva submerged in the flood waters. “Kochi Metro train operation is suspended as the water level rises in Muttom yard area,” a KMRL statement said. 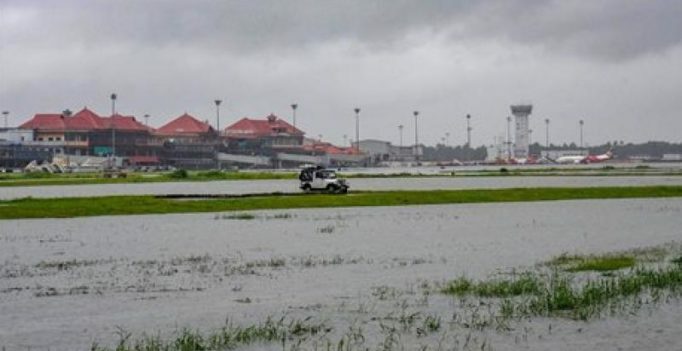 Cochin International Airport had on Wednesday suspended all flight operations till Saturday as water entered in the airport area following continuous rains and the opening of dam shutters in Periyar river.